I was feeling very isolated and discouraged in fall 1969 when a postcard arrived -- 'Can I stay at your house next week, sunday, monday, tuesday? Love, Bob.' 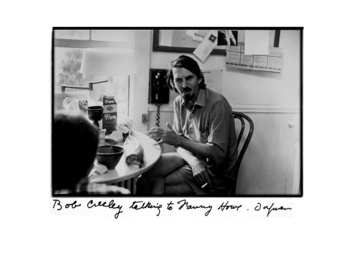 Bob Creeley was the first friend from out of town to visit me. He and I can sit for hours and talk and drink coffee. We have the same impulse to nail down, to assure ourselves of our places in our friends' hearts, to be sure that everything is all right, to be sentimental about place, where we grew up, locality. Family. We both like to define feelings, work around and around them, spend hours figuring out and laying out a relationship. There are always two or three people who drop by my house when Bob is there, just because he's there. It happens so easily when he's there, putting another pot of coffee on, sitting at the kitchen table, hardly moving till late afternoon. I think of him as a pivotal person in the development of the Housebook, and for lack of another phrase, the Housebook style of my life. 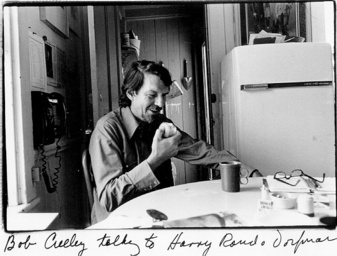 He made it easy for me to get a view of myself being this way and doing this particular thing, opening up to people. You can see -- tell -- looking at the pictures of him. Talking to Fanny Howe. 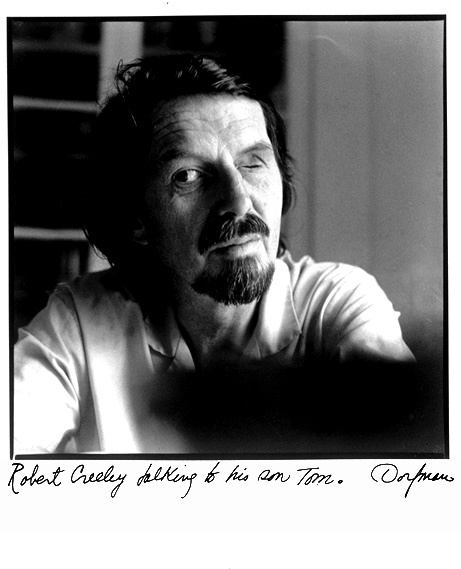 To Robert Duncan. 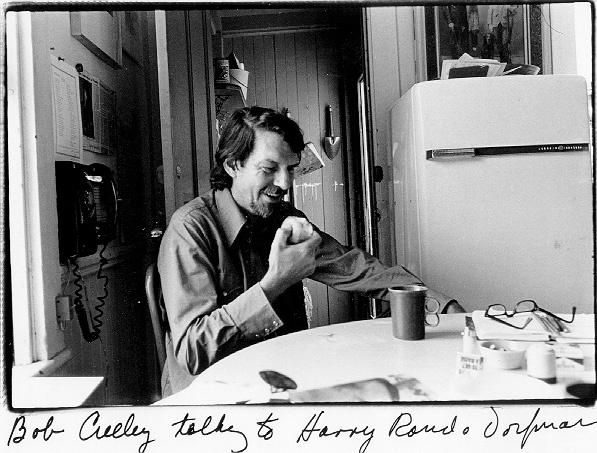 To Harry Rand. Bob has three children who live in or around Boston, and at least one of them comes by to see him, adding to the family atmosphere of his visits. When I took the portrait of him alone he was talking with his son Tom. I wouldn't know Ed Lang if he weren't married to Ilene, which only means I don't usually come across top echelon business executives. It would be a loss, too, for both of us, because we like each other and have a lot to talk about. Part of our fondness is based on our being opposites; he is very athletic, super-organized, thorough, self-disciplined. When I want to find out what's the best way to cope with the details of darkroom technique, or what's the best buy on a bicycle lock, the best vacuum cleaner, the best amplifier, light meter, or what's wrong with my car, I ask Ed. I describe the symptoms: (a) the car backfires; (b) I smell something burning; [c] the inside of the trunk is charred on the lefthand side. Ed listens carefully, thinks for a few minutes, then makes his diagnosis. He is never wrong. There is something right about Eila Kokkinen being part of my photographic career -- helping me edit images, install shows -- because I met her when I worked at Grove Press in New York. 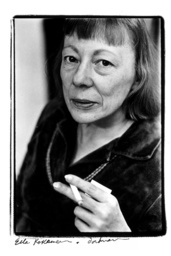 She was a good friend of Irving Rosenthal, who led me by the hand to the poetry shelves of the Eighth Street Bookstore, introduced me to his friends, the poets and writers I photograph now. Winter 1974, Eila came over on a cold Sunday to help pick pictures for the Househook. It is freezing in my house -- sixty degrees to keep the heating bill down. She huddles by the stove, which is blowing dry gassy heat into the room. Out of cigarettes, she wants to walk to Cahaly's three blocks away. In this cold'! For cigarettes? Cancer, I remind her virtuously, like a good friend. She can't concentrate on my images; all she's thinking about are her ciggies. 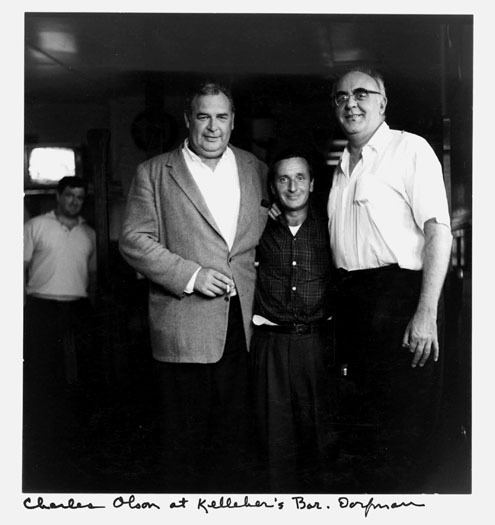 Finally, I remember that Charles Olson once sent a taxi for cigarettes when we were having supper in a restaurant which didn't have his brand. If Charles can, so can we. I call an Ambassador cab. If you see a picture of yourself on this page, and you do not want it to be here, contact Elsa immediately.